Dress up for the occasion with our beefy 100% cotton t-shirts, ball caps and beanies. Each one lovingly silkscreened or embroidered with style. 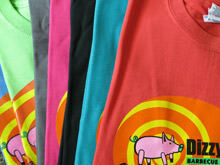 Or share the love and give a little Dizzy Pig something to a friend.